Ahead of the UN Bonn Climate Change Conference in November, due to be presided over by the government of Fiji, the United Nations University Institute for Environment and Human Security (UNU-EHS) has released a series of reports detailing how climatic changes are impacting communities in Pacific island states. The reports show that many small island inhabitants need support in order to adapt to the changing climate, including help to migrate, and that the Paris Climate Change Agreement represents an important opportunity to access such assistance. Focused on the Pacific nations of Tuvalu, Nauru and Kiribati, the research found that environmental impacts likely related to a changing climate have already affected households significantly over the 10 previous years and are likely to drive migration in the future, as people move in search of more secure livelihoods. In Nauru, 74% of households experienced one or more impacts of environmental change in the last decade. The availability and quality of water is the most severe environmental stress affecting the island, as drought and irregular rains already impacted 61% of the surveyed families. Although environmental impacts are not triggering movement in Nauru yet, over a third of Nauruan households believe that migration will be necessary in the future due to climate change. However, only a quarter of households believe that they would be able to afford to migrate in the future. In Kiribati, almost every household (94%) was impacted by natural hazards over the preceding 10 years, with 81% of them indicating that they had been affected by sea-level rise. In Kiribati, most migration is currently from the outer islands to the capital of South Tarawa, intensifying existing overcrowding and water shortages. There is very little international migration which could act as release valve for this situation. In Tuvalu, environmental conditions triggered 9% of recorded movements in 2005-2015 and the majority of households indicated that they feel that migration would be a necessary strategy if climate change impacts worsen their basic living conditions. Sea-level rise (76% of respondents), saltwater intrusion (74%), drought (72%) and floods (71%) are the most likely environmental factors thought to trigger future migration. 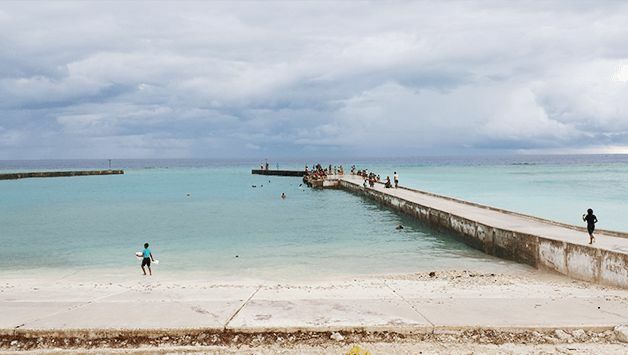 While 97% of surveyed households in Tuvalu reported they had been impacted by natural hazards between 2005 and 2015, only 53% of the people perceived they would be able to afford migration in the future. The UNU-EHS studies clearly indicate that national and international policy support will be necessary to assist vulnerable people in the Pacific Islands. Without the capacity to move in a deteriorating environment, people may be trapped. The reports conclude that the Paris Climate Change Agreement presents important opportunities for such countries, given that the agreement has for the first time put adaptation on an equal footing to curbing greenhouse gas emissions, thereby increasing the likelihood of Pacific Islands being able to access resources. The Paris Agreement also addresses issues related to displacement, and requests the Executive Committee of the Warsaw International Mechanism for Loss and Damage associated with Climate Change Impacts to establish a task force to develop recommendations for integrated approaches to avert, minimize and address displacement related to the adverse impacts of climate change. The reports also say that regional integration, with the development of bilateral agreements and a stronger collaboration on climate change, could strengthen the ability of the islands ability to adapt and facilitate migration in the future. Professor Dr. Jakob Rhyner, UN University Vice-Rector in Europe and Director of UNU-EHS, says: “Our research shows that people in the Pacific island nations will be under strong pressure from environmental stressors, including rising sea levels and droughts, which may contribute to increased migration.